Several years ago I read a study that said the national average for accidents per driver was around 1 accident every 6 years. 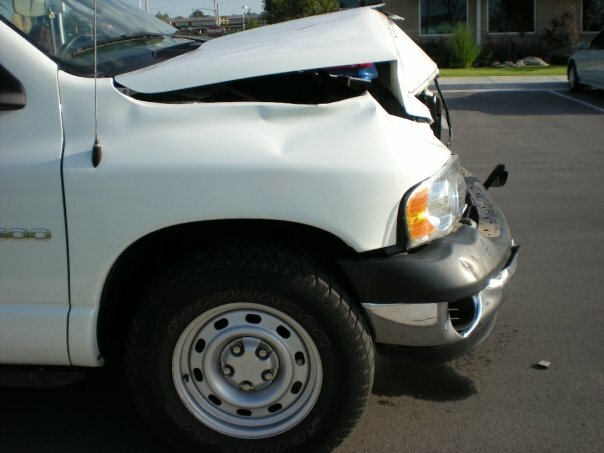 In the 9 years that I’ve owned my truck, I have been involved in 4 accidents that have caused damage that required a visit to a repair shop, and no fewer than a dozen incidents where my truck wasn’t damaged (incidents like hitting a parked vehicle, demolishing a brick mailbox with my trailer hitch, and backing into light poles). 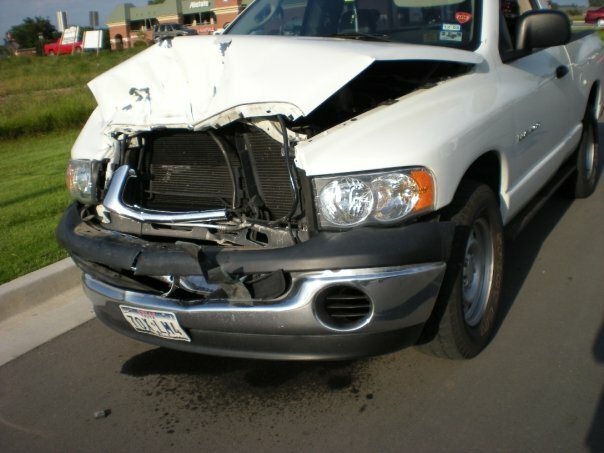 That’s not to say the other party involved didn’t sustain damage, just that my truck was unscathed. The details: I was heading home from work one day – mere months after coming into possession of my truck – and the traffic at that intersection at that time of day is almost unbearable. I noticed that a car was waiting to turn into the shopping center in front of some traffic, but I didn’t think anything of it until she gunned it when I was only a couple feet from her and she hit my fender. I don’t remember how I got into the parking lot to assess damage, I just remember being really stunned. I was upset once I got out of my truck, and the lady in the other car was just like, “Oh my God. 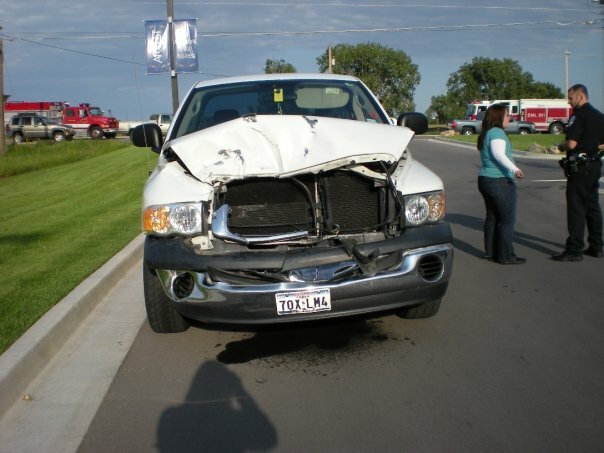 You’re not injured and your truck is fine; you need to calm down.” And while I agree with her assessment of the situation, this specific incident was my first accident ever and I had just paid my first payment on my truck, and I was just really shaken up. Tears were shed, but both my parents and my grandparents were with me less than 20 minutes after the accident, and they did a better job of comforting me than that jerk of a lady (who then called my insurance and blamed the accident on me). We got everything straightened out though, and I had my truck back within the week. The details: I had stopped by Hobby Lobby to pick up supplies for a friend’s birthday present that I was making, and on my way home I thought to myself, “I hate making left turns on 529 without a light, so I’ll go out the side exit and just wait for the light there. I sure would hate to get into another accident!” Well, when I finally made it to the light and it turned green I entered the intersection and started making my turn when I saw a smallish black projectile fly across my windshield. I looked to my right to see where it came from, and saw a guy in a big white van staring at me like, “Ohhhhhhhhhh SH*T,” and I remember giving him a funny look like, “What’s wrong, dude?” and then I realized that he and I were both sitting at weird angles in the road and I pieced together what happened – hello, Bekah, you were in an accident! From what everyone was able to determine, he ran his red light while I was mid-turn on my protected left turn, and the force of the strike to the passenger side of my truck bed was hard enough to swing my truck to the right and he hit the passenger front quarter panel as well. When the cop showed up there were several witnesses already in the parking lot and I had cried enough to create mascara trails down my face. The officer interviewed me first and did his best at comforting me, and then when he turned to the guy he was like, “Seriously dude?! What did you do? Can’t you see how much she’s crying? !” The cop just kept getting more and more angry at the guy while he was talking. Apparently he was a teacher in Cy-Fair ISD, he was getting ready to take a group of 8th graders on a road trip for a band competition, and he didn’t have his driver’s license on him. All of the witnesses were really nice though, and my parents were once again on the scene almost immediately to make sure I was ok. The details: I was shopping for groceries for a short camping trip my friends and I were going to take over the weekend. I called my friend to let her know I was heading back to campus, packed the back of my truck up, and started driving. Traffic at that intersection is terrible at that time of day, but I was able to get into the turning lane for the light ahead of me without any problems. That is until I saw the nose of an identical Dodge Ram 1500 shoot out from in front of the cars on my right. Her truck hit mine in the exact middle of my grill, and apparently both of our trucks had something to prove because mine jacked up her frame, popped her front tire, and damaged her hood and front quarter panel. Her truck crumpled my hood in and bent my front quarter panels, and everything at the front under the hood was crumpled and shoved into each other; the engine block remained undamaged, thank God. That’s me asking the officer if the other lady was ok. It still hurts to see my truck look like that. Everything under the hood was compressed and shoved into the engine block. This was possibly the most emotionally taxing accident I’ve ever had, and it was just made worse by the crazy tow truck driver that showed up. He started off our interactions by insulting my truck and making a mean joke about my trailer hitch (which was the handiwork of my Pops – the man who shares the spot of “Bekah’s Most Favorite Man in the World” with my dad). He thought better of what he said, then made me laugh and started cracking jokes with all my friends who all dropped what they were doing to come make sure I was ok. He then hooked my truck up and was getting ready to tow it away and he looked back and was like, “Hey, just so you know, your truck is probably totaled,” and then climbed into his truck and drove off. My friends and I just stood in the parking lot for a bit trying to digest what he said and my friend Scott says, “Why would he say something like that?! He could’ve left you on a good note, but nooooooo, he has to make THAT his parting statement!” I can honestly most of why I cried in the accidents was because it’s scary to know that you’re doing fine and your car can be fixed, but that if something else was different it could’ve turned out a lot worse for you, and in any other scenario you might not be standing where you are. I’m already an emotional person to begin with, but the thought of having my truck ripped away so suddenly in its prime – that was too much for me to handle. I cried for about 3 hours straight after that, all the while my friends were trying to comfort me. As it turned out, my truck was NOT totaled, just really damaged, and the people at the repair shop that fixed my truck were all super nice and made sure my truck was done ahead of schedule. I have a sneaking suspicion they finished it early because they were tired of me calling in and checking on its progress. By the second week of my truck being in the shop they knew to expect my phone call by 4:00 in the afternoon, and Robin, the shop manager, would even greet me before I said anything and start updating me. She kept telling me that she had to remind the guys who were working on my truck that it belonged to a girl because they kept refering to the owner (ie, me) as “this guy” and “he” etc. When I finally showed up to pay my deductible and pick my truck up, Robin looked me up and down and said, “Hmmm.. I thought you’d be taller. You’re too small to have that big of a truck.” I laughed and said that’s what everyone says (because everyone does), and she had one of the guys pull my truck around. The guy was looking around trying to find the owner of the vehicle and when I walked up to ask for my key his face said, “No, small child.. Where’s your mother? 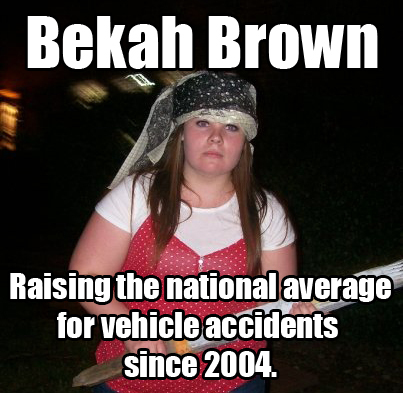 She’s the one who needs the key,” so I responded with, “Hey – I’m Bekah, the owner of that truck. Can I have my keys so I can take it out for a test drive?” He apologized for thinking I was too young to own the truck, asked me if I was able to see over the steering wheel (get new material, folks.. that’s an old one), and handed over the key. The details: I had just started going to my church, and I was in the stage where you know everyone and everyone else has a pretty good idea of who you are, and friendships are still in their early stages and you don’t really want to do anything weird in front of these people because it wouldn’t be awesome to have those moments in their memory of you so early on. My church goes out to eat after service every Sunday, and this time we were all headed to Jason’s Deli on Westheimer and Shepherd. Given my history of left hand turns and accidents, I normally try to make a protected left turn whenever possible. But at this point I was headed toward my 4th year of not having a single accident, so I was getting cocky in my abilities to drive in busy areas and remain untouched. So I made an unprotected left hand turn from a back road. Traffic in that part of Houston is never really all that great, and I was getting kind of self-conscious because I could see that the long line behind me was all my church family, and I knew they all knew me well enough to know that I drove a big white Dodge (to be fair, that’s often one of the first things people learn about me other than my name and that I have a best friend named Krista). Then my uncle (not really my uncle, but he and his wife are basically family to me, so they’re my aunt and uncle) thought it would be funny to honk at me as he pretended to be upset about the situation. I wasn’t too worried about him because he jokes around like that all the time, but I did decide I needed to go pretty soon so I inched out, looked left (it was clear), looked right (it was clear), and I pulled out to make my turn. As I did that though, I looked left again and saw a Mercedes speeding right toward me and had time enough to just scrunch my face up in anticipation of the impact. She hit my driver’s side door and messed up the alignment of the door, but my step bar (also the handiwork of my Pops) absorbed most of the impact and prevented her car from striking anything important. A couple people from the church followed our cars to a side street while we exchanged insurance information, but everyone remained very civil and not a single tear was shed – an accomplishment previously thought to be impossible when my truck is involved. It was super awkward having to still go to lunch after that because everyone who had witnessed the accident was already sitting down and eating their food and watched me park my dented truck and walk in. I was greeted with cheers of, “Heyo!” and, “There she is!” and, “She’s alive! !” by people I barely knew. Thankfully they don’t often refer to that moment, which I find very comforting because it was truly awkward to have that many new friends witness everything unfold.